If you have been searching the Internet for the top mobility product reviews, you may think it is impossible to get great quality mobility products (such as electric power wheelchairs) at a price you can afford. At AllTerrainMedical.com, however, we are proud to offer the best cheap electric power wheelchairs and other mobility products on the market. We also carry a number of accessories for your mobility products, including offering more than a dozen different batteries for you to select from! By offering only the best cheap electric power wheelchairs available on the market today, our goal is to help you increase your mobility while also keeping your investment to a minimum. This way, you don't have to think "I could never afford that product." 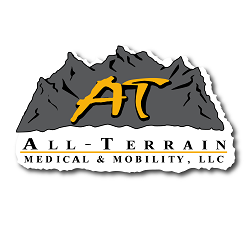 With AllTerrainMedical.com by your side, you CAN afford the best mobility products so you can live your life to the fullest! Frequently Asked Questions Do you offer an electric mobility scooter for sale at the best prices? Do you have an electric wheelchair that will give me the most access, at a fair price? Do you have handicap equipment that includes scooter lifts, wheelchairs and walkers? Do you carry handicap walkers at a good price? What kinds of pool lifts do you sell? What can your scooter ramps do for my mobility? What kind of shower chairs do you carry? Can I get a vertical wheelchair lift from your company? Can you design a wheelchair ramp for my home? Do you sell wheelchairs and wheelchair accessories? Why should I buy a shower chair from All-Terrain Medical (...when there are so many other online providers)? Start browsing the best cheap electric power wheelchairs available on the market today at AllTerrainMedical.com. Visit our Power Wheelchairs page and start browsing today. We are certain you will find exactly what you are looking for. If you have any problems finding the right mobility device to suit your specific needs -- or if you have any questions about any of our products – just complete our simple online contact form or call us toll free at 1-877-ALL-TER-1. We are here to help make your Mobility easier! Best cheap electric power wheelchairs, top mobility product reviews, great mobility products.